This year, FSD took part in Global Entrepreneur once again. It is an internship programme offered by AIESEC. Its purpose is to give young people an opportunity to explore, learn and contribute to a startup. AIESEC chose FSD as a truly international company that works with global clients. 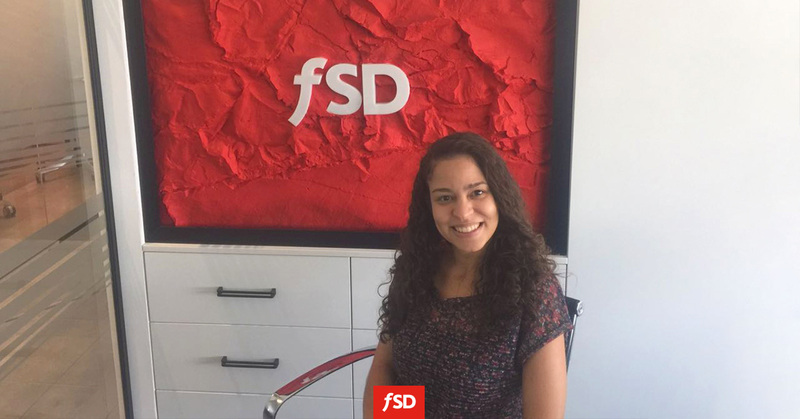 In May Tarsila, an intern from Brazil, joined our Marketing team. My name is Tarsila Maria Goes. I’ve graduated with major in Business Administration. Afterwards I got my master’s degree in Project Management. At the moment, I am working as a HR assistant in an international company in Salvador. I applied for this internship because I wanted to learn more about digital marketing. Also, a year ago I started a small fashion company on the side. I thought this experience would help me take my business to the next level. I got even more knowledge than I expected. When it comes to hobbies, I enjoy traveling and meeting different people. In my opinion, learning about different cultures is very important. Not only because I work with people from various countries, but because it makes life richer. Why did you chose Serbia? How do you like it so far? It is an uncommon destination for Brazilians. Most of them visit only Western Europe. It was interesting for me to come where my people usually don’t. It has been an awesome experience so far. I was pleasantly surprised how friendly everybody is. You are very similar to Brazilians in that way. I love everything about Serbia and Novi Sad. The people, the city, the food. Cultural exchange was very rich. When I think about it now, I don’t think I could have chosen a better destination. What it is like to work for FSD? It was the first time I worked in an IT company. The atmosphere is great, people are friendly and easygoing. They are creative, innovative and focused on the goals, as well as the company itself. Their hard work and effort to deliver high-quality products is appreciated. The whole company received me so well. I feel very welcome here. My internship programme was great. It gave me both theoretical and practical knowledge. I was involved in every aspect of marketing in the company. Besides that, I took six different marketing certifications during the past six weeks. I’ve learned so much more than I expected. For me, that was the most important part of the internship. My mentor Danka was teaching me various marketing strategies and tactics. I will use them not only in the IT industry, but for my own business as well. The whole experience was amazing and I’ve learned a lot while working with her. What have you learned so far? What was the most helpful thing you have learned? I have learned a lot about digital marketing in general. Also, I discovered SEO -- a whole new world that I didn’t know it existed. Before the internship I wasn’t using social media at all. Now I know a lot about it and many other things. My mentor was there to explain in detail everything that we were working on. Also, she always tried to make connections between the marketing theory and practice. The most important part for me was learning how to create and analyze a marketing campaign. I will never see a website the same way that I did before. When I look at it now, I see a lot of different strategies and tactics that I wasn’t familiar with. That being said, I think that everything I have learned about SEO and blogging would help me most. Are you more interested in marketing now? Of course, I am in love now. I know how to look for things that I didn’t use to recognize before. I am observing everything from a marketer’s perspective now. Do you think this internship would help you in the future and in which way? For a person with a MBA degree, marketing might be the next logical step. If I chose to follow that path in the future, I would feel more confident and prepared. It would also help me in my current job and in the business I have started. During this internship I got a lot of new ideas how to improve my company. I can’t wait to come back to Brazil and make it bigger and better. Now I know how to apply inbound marketing and connect with clients. Which advice would you give for future interns? Try to get the most knowledge you possibly can. Ask your mentor or other employees anything you want to know more about. Get involved in courses and practical activities. Continuous learning will make your life richer and more meaningful.